A lovely light dish, full of flavour and nutritional value from The Medicinal Chef by Dale Pinnock. I served these courgettes with a spicy carrot mash and wilted spinach but they are also delicious served with a chicken fillet, a piece of steak or some fish. Heat a little olive oil in a pan and add the red onion. Cook for 4-5 minutes or until softened, then add the balsamic vinegar and honey. Stir well and keep cooking until the mixture becomes sticky. Set aside. Cut the courgette in half lengthways. Carefully scoop out the seeds to create a trough. Place the courgettes, trough side facing downwards, on a lipped baking tray with a small amount of water in the bottom. Bake at 200° for about 15 minutes or until the courgette begins to soften. At this stage, carefully drain any remaining water out of the baking tray and turn the courgette halves over. Fill the troughs with the onion mixture, season with salt and pepper and crumble the goat’s cheese over the top. Return to the oven for another 5-8 minutes or until the cheese is lightly golden. Either boil or steam carrots until tender. Mash well with butter, spice, salt and pepper. Once smooth, stir through chopped parsley, and serve. 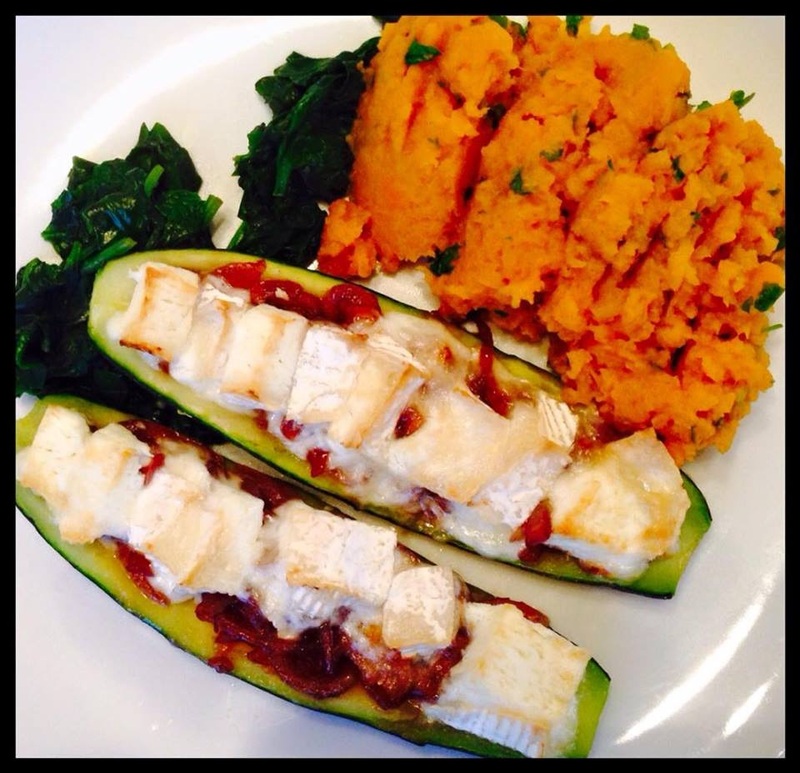 Courgette stuffed with balsamic onions and goat’s cheese served with spiced carrot mash and wilted spinach. This entry was posted in Dinner, Vegetables and tagged Carrots, Courgettes, Dinner, Gluten Free, Goat's Cheese, Healthy Eating. Bookmark the permalink.